​Is Amazon turning a page with hundreds of real-world stores? Amazon (AMZN) might be poised to make the ultimate about-face in the annals of the Internet. The online retailing giant is reportedly considering opening hundreds of physical bookstores, according to comments made on Tuesday by General Growth Properties CEO Sandeep Mathrani. "Their goal is to open, as I understand, 300 to 400 book stores," he said. Mathrani, who was speaking on his company's earnings conference call, didn't say where he heard the information. Amazon has already dipped into brick-and-mortar bookselling, as it opened a real-world store last year in the Seattle neighborhood of University Village. That store is geared to leveraging both Web-based and real-world sales, allowing customers to order online and pick up their books at the store, while also providing Kindles and other devices to test out. While it's unclear how Amazon's plans might unspool, retailers -- both online and real-world alike -- are increasingly trying to leverage both retail models to capture consumers' fickle spending. "I think Amazon's approach with the bricks-and-mortar stores is as much about showcasing the company and some of its products as it is about selling books," said Shelf Awareness editor-in-chief John Mutter in an email. "One indicator: the Seattle store's centerpiece are tables with Kindles, Fires and other electronic devices." An Amazon spokeswoman said it doesn't comment on rumors and speculation. "To a degree, too, I think they want to see how people react in the real world to their sometimes unusual sales approach," Mutter said. "For example, the store in Seattle doesn't post prices -- you have to take a book to a bar code scanner or use an Apple app on your phone to find that out. And they emphasize titles that sell well online and/or get many positive reviews from Amazon customers online." 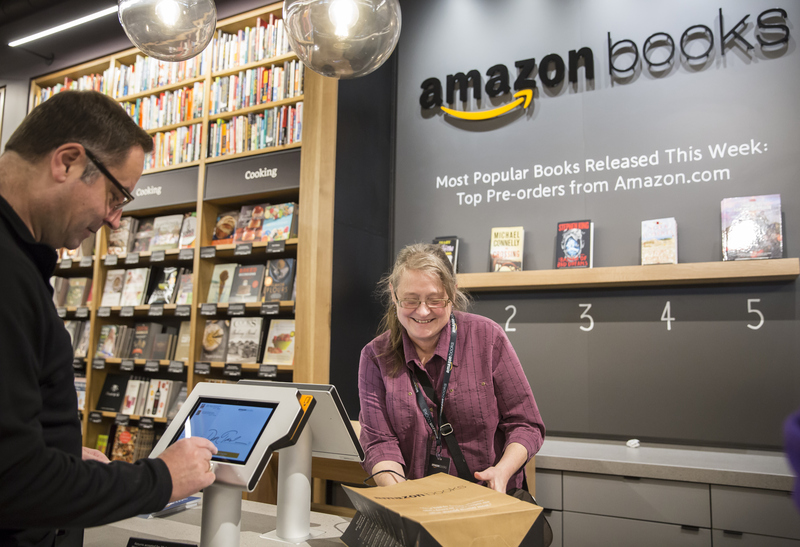 An expansion into brick-and-mortar stores by Amazon might be the sort of plot-twist that would keep independent bookstores and large chains at the edge of their seats. Shares of Barnes & Noble (BKS) fell as much as 10 percent in trading on Wednesday, amid investor concern about how a real-world expansion from Amazon might impact the chain. Ironically, sales of printed books have been fending off e-books, which fell 11.1 percent in 2015, according to the American Association of American Publishers. Sales of trade adult books increased in almost every month during 2015, the group said last week. "Independent bookstores have had a resurgence over the last three or four years," Mutter added. "Their sales rose about 10 percent last year, as measured by the American Booksellers Association." On top of renewed interest in printed books, consumers are also responding to "buy local" movements. Then there's the benefit of having a real-live bookseller recommend a title, rather than relying on online reviews that may or may not be genuine. Publishers are also lending more support to small booksellers, given some of their recent battles with Amazon, which has been demanding more favorable terms from the publishing houses, Mutter pointed out. "Amazon might be reacting to the indies' resurgence, seeing that there is an enduring market offline for books," Mutter noted.